Resource persons along with the participants of the one-day state-level Gipa consultation and dissemination of HIV/AIDS (Prevention and Control) Act of 2017 programme, in Kohima on April 3. 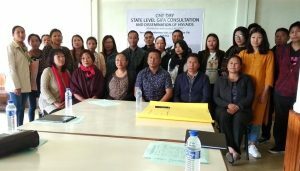 Kohima, April 3 (EMN): With an aim to equip people working in healthcare with more knowledge of the rights and responsibilities of people living with HIV, a one-day state-level ‘Greater Involvement of People Living with HIV/AIDS (Gipa) consultation and dissemination of HIV/AIDS (Prevention and Control) Act of 2017’ programme was conducted in Kohima on April 3. Legal consultant of Nagaland State AIDS Control Society (NSACS) N Mozhui told the gathering that the HIV/AIDS (Prevention and Control) Act of 2017, which was passed by the government of India in April 2017 and subsequently enforced across the country in September 2018, focuses on ‘discrimination,’ which is inserted in Chapter 1 of Section 2 (d). Joint director, Information, Education and Communication of NSACS, Metevinuo Sakhrie said that the spirit of the Act is to safeguard the infected and affected people with HIV and AIDS, as well as related to discrimination including denial of jobs etc. It also protects the rights of the minors, she added. She updated that the state is in the process of bringing out its official gazette that has already been put up at the state cabinet for approval. Nagaland is one of the few states to have done that, she added. Sakhrie also spoke on the importance of one’s responsibilities that should go along with the rights. The three main policies of the government to uplift the status of the people living with HIV (PLHIV) are 90:90:90 – 90% of all people living with HIV will know their HIV status; 90% of all people with diagnosed HIV infection will receive sustained antiretroviral therapy; and 90% of all people receiving antiretroviral therapy will have viral suppression. Test entry policy, which focuses at receiving free treatment irrespective of age and gender, and introduction of the Act were the other policies. She urged the people to contribute for the society and enlightened that one of the NSACS’ action plans for this financial year is to create awareness on HIV and AIDS at all the block and village levels. Administrator of Legislators’ Forum for AIDS, Hukatoli Chophy emphasised on living responsibly, particularly being a PLHIV. ‘Our duty is to let the doctors know that we are having HIV and AIDS, so as to get the right treatment at the right time,’ she said. She appealed the people to have the spirit of volunteerism. One should not be discouraged by lack of fund but introspect and extend all possible help, she urged. Speaking of the stigma attached to the PLHIV, she said that it is not impossible to do away with it, provided people carry out their responsibilities dutifully. Mozhui explained the Act to the participants earlier during the programme. He said that the Act defined HIV-affected person as an individual who is HIV-positive, whose partner is HIV-positive or has lost a partner due to AIDS. Also, the ‘HIV-related information’ means any information relating to the HIV status of a person including result of HIV test; care, support or treatment of that person; identify that person; and any other information concerning that person. Further, he explained that the HIV-protected person is defined as a person who is HIV-positive, ordinarily living with a person who is HIV-positive, or ordinarily lived with a person who is HIV-positive. Other topics of the day included, ‘overview of care, support and treatment (CST) under NACO’; ‘public speaking, participation and positive living’; and ‘organisation management and mainstreaming’. The resources persons were Dr Nitovi, DD CST, NSACS; Dr Viketoulie, SMO, State Mental Health Institute, and Shan Ezung of FHI360. Earlier during the programme, president of Naga Network of People Living with HIV, Lanu gave the opening remark.